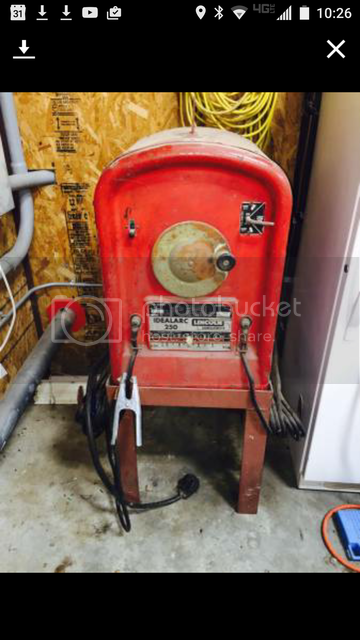 Thinking about upgrading my garage welder to an old Lincoln Idealarc tombstone AC/DC 250 . Currently running an older Lincoln AC/DC 225 that I've mentioned in previous posts. It has served me well, built my pit as well as several other projects around the house. Was thinking about taking it apart so I can extend the leads and do a few other little things to it. The other day I was welding on some thin wall pipe and although I got the job done, I was having a hard time with the limited amp selection available on my 225. Would be nice to dial in exact amparage instead of choosing between 65 or 75 amps. Then the power switch started acting up, not wanting to switch off. He wants $475, I'm thinking $350-400 is fair depending on how much lead he throws in. then I'd sell my old 225 to offset it. I bought my 225 for $100 a few years ago, no sentimental attachment to worry about. What do y'all think? Good upgrade? I wont ever really weld anything over 3/8, so its probably way more machine than id ever need, but i guess thats better than not having enough. I know a newer Hobart stickmate would be similar price range, but I do prefer older bullet proof equipment if I can do it, not to mention the Idealarc is way more machine. I had a Lincoln tombstone I got from one of the box stores for a couple or few hundred bucks, new many years ago. For ease of use you can't beat a mig. Most versatile you can't beat a tig . Convenience and less moving parts and maintenance stick is the winner. I still have a Oxy acetylene set up, that was the 1st equipment I used on my 1st welding adventurer in my teens, now 43 years old. Man I have burned a many a rod on a machine just like that one. If you have a dedicated 100 Amp service she will run great I am not sure how well it will go with a dedicated 50 Amp. You may get by on a 50 but when you jump to a 1/8" 7018 your'e gonna tax the circuit with that 250. 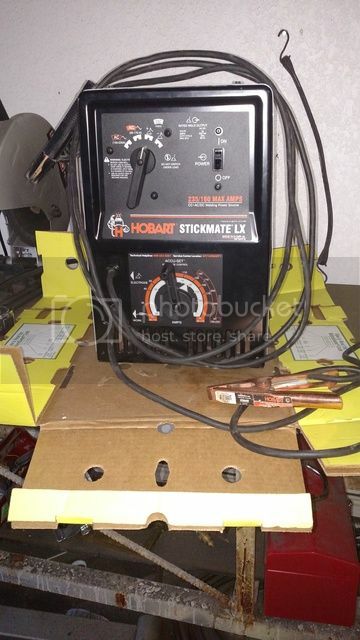 The Hobart stickmate 225 Ac/Dc will last you years and will weld pretty much anything you want. It is basically a Miller with a different cover color. You will get your infinite amperage with it. Thanks for getting back to me my friends. Gandrfab, I'm really only interested in stick welding. Feel like I'm cheating when I mig, just too easy, I'd consider a mig if I ever got into auto body resto or something. And I can't afford Tig. Might rig up a scratch start Tig one of these days though, just not with my current machine. KAM, sounds like you think it would be too much machine for the typical garage. I am on a dedicated 50 amp now, I could have my electrician buddy come by and see if I could safely convert to a larger breaker. My 50amp is ran on 6-3 romex right now, only a foot below the breaker box. I've read on some other forums that guys run these welders off 50 and 60 amp breakers just fine.... Can't put anything on the internet that isn't true, right? I use a 3/32 7018 99% of the time anyway, so I wouldn't typically be turning the machine even halfway up. Is there a noticeable difference when welding between my current machine and this one? Smoother arc or anything like that? I have until Tuesday to decide on this, seller is out of town until then. He did disclose that the amp indicator does not work, he said the dial works fine, but there is no way to see where you are set. Anyone know if that's a simple fix? What do y'all think a fair price would be, assuming everything else works fine? You will not notice a difference in the two machines other than you can dial in a little better with the 250 because of the infinite amp settings. You may get buy running just the 3/32" rods. Just watch out for when you want to run larger rods. The machine can handle it but your circuit may not. To be honest I rarely ever ran anything less than 1/8" on mine when I was fabricating oil field trucks but then again 1/4" plate was the thinnest I welded most of the time it was 1/2" or better. On the amp indicator if the slide is still moving in the machine you can see where you are set without the vee outside. It should be a vertical slit inside you can see but check on that to see if it works. If not then negotiations are in order because he is asking premium for the machine. I'll take a look at it when he gets back to town but I'm probably gonna pass on it unless he comes way down on the price. Did a little welding earlier today with my 225, there's nothing wrong with it, probably need to just run it until it quits. I'll probably quit before it does anyway. Thanks for your advice KAM, much appreciated as always. You should have 150 or 200 amp power feed to the house. This may not be to code. At a friend of mines house that had 150 amp going to the house. backlash just about everything in the house had to be turned off to do any kind of heavy welding. Got us started in his garage then moved to a 1200sq place. Yeah, its an hour away too. I'll talk with him about his price before I make the trip. It's been listed for a while with no takers, hopefully he's realizing its not 1992 anymore and his machine isn't that valuable. The idea of just upgrading to a new Hobart stickmate is starting to grow on me anyway. We'll see how it goes. Well, through further research, I've changed my mind again and am now looking at the newer Hobart Stickmate. I think it will do everything I need. Gonna go test one I found on craigslist out tomorrow. He Was asking $420, have him talked down to $375. Says its a 2009 model, seems fair to me looks like its really clean. Cheapest new one I could find online was $490 shipped. I'll let y'all know how it goes. Most stick welding machines age well. I passed my 6G on 3/8"wall 6" pipe with a 1960's machine. That is a good deal on an AC/DC machine JLCBBQ. There is not a lot that goes wrong with a stick machine that cannot be repaired easily and at a fare price. You should see years of service out of that machine. The search is over. Brought this guy home today. Hasn't even been used enough to wear the stickers off the ground clamp. Bought it off an old retired electrical engineer that had taken great care of it. Pretty happy with the purchase. Thanks buddy, I guess it's time to build another pit now!